It’s a sunny Saturday evening at the corner of Adams and Center Street in Tacoma, and the Melon Seed Deli is bustling with activity. Amid a bright neon backdrop and retro-style furnishings, couples, families and teens congregate to chat over dinner or dessert. Reggae music blares as employees buzz around, greeting customers and preparing colorful made-to-order sandwiches and salads. In the center of the action, you can find owners Mac and Tashia Charles putting finishing touches on frozen yogurt creations. 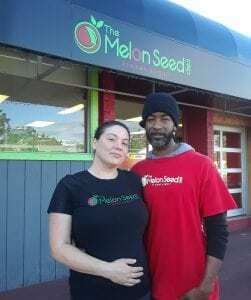 Since opening up shop in 2013, the husband and wife team have grown the Melon Seed Deli into a community fixture through their passion for serving fresh food with quality service. While Mac and Tashia kept coming back to that idea, it would be a couple of years before their dreams materialized. Bit by bit, other pieces of the business started coming together – like the red, green and white color scheme, and the idea to add salads and sandwiches to the mix. “Every time we went out to get fro-yo, we would be hungry afterwards,” Mac explains, so sliders and other light fare seemed like a perfect addition. Still, “it was a slow process,” Tashia recalls. For a while, they considered opening a food truck. 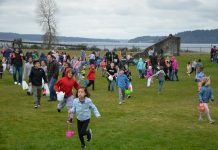 But things started to fall into place after they got word from a friend that a space in Tacoma’s Madrona neighborhood had become available to rent. From there, everything started coming together. 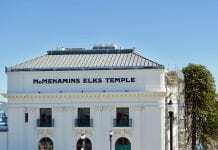 The location – just blocks from where Tashia grew up – felt like another piece of the puzzle. “That’s what’s really cool about this building,” she reflects. As a kid, she remembers that food options in the neighborhood were sparse. “There was a McDonald’s and a couple teriyaki places that rotated in and out. That was about it.” And something felt right about being able to serve fresh, delicious food right in the neighborhood – somewhere you didn’t have to travel downtown or to 6th Ave to enjoy. “We wanted to bring something nice to the community,” Mac adds with a smile. With the lease signed, the couple tasked themselves with renovating their new space from the inside out. What they thought would be a quick paint job and countertop installation swiftly turned into a more extensive project. Soon, they found themselves stripping the floors to fix piping under the building. As Tashia recalls, “I was pregnant with our first kid, and everything was dug up six feet.” The remodel included installing a garage door, which they now love to open on sunny days, and repainting the building a cherry red. The food itself brings in influences from all over, but the common thread is fresh ingredients served with a burst of creativity. The Melon Seed Deli features everything from twists on the classics, like the Reuben and Cubano, to elaborate goodies like the Bahama Mama. 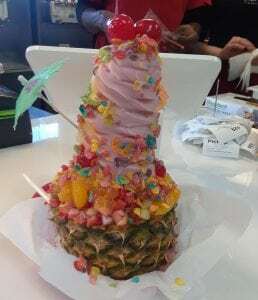 To create it, Mac first hollows out a pineapple and fills it with frozen yogurt. 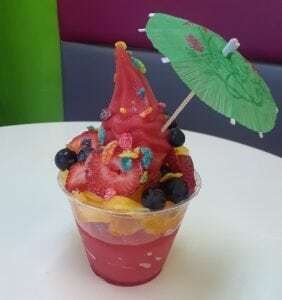 He then carefully tops it with a mix of fresh fruit, fruity pebbles for a little crunch and colorful parasols. The result is a bright and tasty dessert that’s perfect to split with a friend. 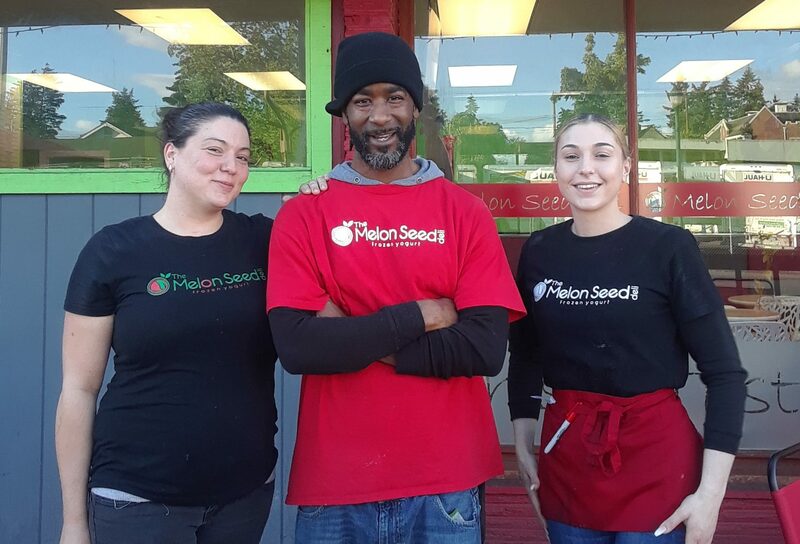 You can check out the Melon Seed Deli at their location in Tacoma on 3807 Center Street. For more information, head to their website or Facebook page.